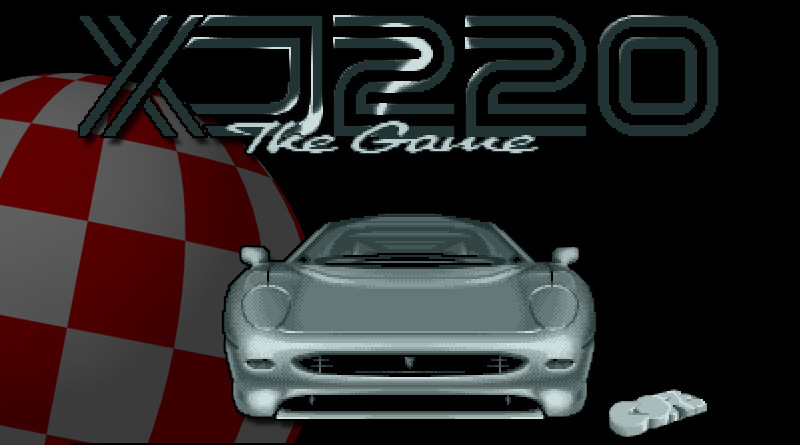 Jaguar XJ220 The Game was released for the Amiga in 1992, the same year as the third installment of the Lotus series. It joined a short list of Amiga racers that featured a licensed car manufacturer or model in the title, the others were. It was developed and published by UK based Core Design, the same company that went on to give us Tomb Raider just 4 years after Jaguar XJ220. Core bowed out of the Amiga scene with 1995s Skeleton Krew. Sadly, 2006 signaled the end of Core as its assets were sold off by its parent company Eidos. The game fits onto 2 disks and thankfully is able to use external floppy drives which makes for a smoother experience. Saving your progress requires you to swap one for you game save disk. You can control your 200+MPH Jaguar XJ220 using joystick or interestingly enough the mouse! Generally, the names of real world manufactures or drivers are tweaked in games to avoid falling foul of licensing or copyright issues but not here. Bugatti, Porsche, Corvette, Lamborghini and Ferrari are all mentioned by name and their cars look as they should. Before each race you can choose from effects or one of six tunes using the cars CD player. You can’t have a mix of effects and tunes in this game. The good thing is that the music in this game is varied and mostly excellent. The CD player also has a radio function and if you select it (click on mode) you can scan the airwaves to find some chirpy tunes including the A Team theme (a frequency of 065.4 if you are looking – this will also activate a cheat allowing you to break the track speed record no matter your time). If you opt for sound effects you will hear an engine that is mildly annoying when your car is at or approaching max speed. Going through a tunnel or under a bridge will muffle the sound of the engine. Tyres screech as you corner at speed and there are the usual clanks and bangs when you hit other cars etc. Whichever option you choose some sampled speech and the wave of a flag announces the start of each race. There are 3 tracks for each location. It’s not clear if these are road or closed circuit races as you will see scenery applicable to both here. Road side obstacles include chevrons to indicate corners, street lighting and obligatory logos for the developer and Jaguar. There may have been deals with various games magazines too as CU AMIGA and CVG logos are also seen (perhaps to grease the wheel when it came to review time!). One roadside object that stands out is the humble fence. Core actually did something rather clever here that would be easy to ignore as you zoom past. You will notice that the fences are all linked and appear as one continuous object. Each upright is connected by 2 lines to the next in the sequence to form a chain. Even more impressive is that these links will follow the rise and fall of the road as well as the corners. It’s a really neat effect. The very first race takes place on a track which only features road side objects located very close to the track. Others feature a greater depth, the third track in England has rocks and trees that are three deep. Drive in Italy and you will be racing along precarious roads with nothing but a fence between you and a sheer drop on one side and large amount of exposed rock on the other. Oh and keep an eye out for the cheeky birds perched on the cliff top fences. You will see the usual weather effects during some of the races such as fog and rain. The fog effect cuts your view of the road ahead down to or slightly more than half of the usual draw distance. Luckily, the track side objects are visible from farther away which helps you judge approaching corners. Without those you may have a hard time reacting quickly enough. Rain can change in intensity. You will see either a light shower or driving rain which will cause your car to kick up spray. Do any other Amiga racers offer a variable level of precipitation? Drive through one of the rivers that run right across the track and even more water is splashed up. Tunnels put your car into shadow. Another neat effect here adds more polish and helps the sense of speed. As you drive under the lights within the tunnel your car will be momentarily illuminated. At the end of each race the top three drivers are seen on the podium with their bottles of bubbly as confetti falls. Another nice touch here is that the driver’s overalls will be sporting the name of the correct manufacturer according to the race results. Attention to detail in this game helps it stand out. Complete a race and you are rewarded with cash, which comes in handy later. During the race your Jaguar XJ220 will take damage and suffer general wear and tear. After each race you will get the opportunity to repair your car. Repairs cost money and you will be prompted to repair major damage first. You can check the status of a number of parts using a well presented system. It shows the car from various angles. An area will be highlighted by a flashing outline. If the outline is green then that area needs no attention. If the area is marked with red you will need to buy a replacement. I haven’t been able to determine if all damage is caused by impacts during the race. Certain items may deteriorate over time no matter what. Your first three races are set in England. After this you get to choose which of the other 11 countries you would like to visit next. Traveling the world isn’t free though so you will need to choose a destination within your budget. The ability to choose the next location is a good move as it allows you to vary your racing season. You get to see more of the game rather than being limited to a set route. The game moves at an impressive speed without any noticeable slowdown in scenery heavy locations. It can’t quite match the smoothness of the Amiga’s most revered racer Lotus 2 and to my eyes it does seem to take a performance hit during rain. It would seem that the game engine’s speed is governed by your Amiga system. Users with an 020 or higher CPU will find that the game will move at such a rate it becomes unplayable, or at least no fun. The same goes for those using emulators, make sure you lock it down to standard A500 spec. Your position and current lap are clearly displayed in the top corners of the screen, easy to see at a glance. Your current speed is shown bottom right with current gear and remaining fuel bottom left. Surprising that the fuel gauge is so small considering its importance. Racing itself is fairly easy. Other cars will either stick to their lane or move from side to side as they tend to do in racing games. They never change position wildly. Once you pass another car you can usually rest assured that they won’t retake you, even if you hit an obstacle and slow down immediately after making the pass. The game is fairly forgiving. Even after a few minor collisions you’ll still be able to maintain your lead. Drive through a series of road cones though and your speed will drop, you’ll end up in 2nd gear and cars will pass you. Being in the lead does mean that you will face a rather empty track ahead. With every other car behind you the only way to make another pass ( without slowing ) is to see if you can lap one before the end of the race. Passing is quite satisfying, there is fun to be had sliding past rivals on the outside of a sharp bend that you hope ends soon so you can avoid hitting something that was conveniently placed to punish those who run out of road. As well as avoiding other racers and roadside objects you will also have to keep an eye on your fuel level as running out will spell the end of the race. Thankfully, you are able to pull into the pits for a splash and dash top up. Be sharp though as you don’t get a lot of warning when you are approaching the pits and if you are concentrating on other road users you could miss them. Once you are familiar with the track you should be fine. If you are lucky enough to have a friend you can race them using the 2 player mode. Using the standard vertically stacked split screen effect you can race your human rival ( also driving a Jaguar XJ220 ) and the CPU cars. The thin, letterbox window can limit your view of the track on steep climbs but the pace is maintained. A red arrow hovers over your human opponent’s car allowing you to gloat when you pass. If a second joystick isn’t available then player 2 can use the mouse to play. It’s not as horrible a control method as it might sound. Accelerate and brake are mapped to the two buttons and moving the mouse left and right controls steering. Unlike the joystick you will need to centre your steering and it’s automatic gearbox only with the mouse. Using the mouse actually gives you a finer degree of control over the steering, the joystick takes you to full lock quickly but with the mouse you can go to full lock or just nudge the steering to gently glide across the track. This game could work well with a steering wheel. To top off everything off a track editor was included. This allows you edit any of the 36 pre-made tracks, or you can make your own from scratch. Sections of track are added in a top down view. You could make a basic oval and then work your way around block by block adding extra details. Corners, gradients and scenery are all adjustable. There are a lot of options here to explore and try. You could end up with a racing masterpiece or a twisted nightmare. Save your creation to disk when you are done. Not the easiest system to get to grips with but you could replicate real world tracks with a bit of effort. This is a very good looking game. It is OCS/ECS but manages to squeeze every drop of colour out of the system. The sky has a nice gradient. The tracks can transition to different colours when moving to a different type of surface. The cars are very well detailed and it’s clear what everything is supposed to be. Unlike a game like Outrun where distant objects can be a mess of colour and pixels, care has been taken to ensure that things scale as well as possible. It is inevitable that this game will be compared to the king of Amiga racers, Lotus 2. While not quite as smooth as Lotus, Jaguar XJ220 manages to be just as playable, packed with features and just different enough to warrant your attention. This is one of the top racers on the Amiga, worthy of a place in anyone’s collection. One of the Head Amigos recently played Jaguar XJ220 as part of an Amiga racing stream. Take a look at the game in action. Like you say, Core were brave taking on Magnetic Fields at their own game. Not a bad attempt at all though, even if it is a bit derivative. Great game but not as good and fun to play as Lotus was. For me there were too many tracks, I would prefer to have less tracks but with more variety. Jaguar can do that on some tracks both with atmospheric effects like falling snow, rain, leaves and attractions on road like single/many rocks, tunnels, cliffs and rock walls, fence, one track even got waterfalls. Backgrounds/tracks vistas were boring as hell, nothing on Black Viper/Lotus level.